Thursday September 24th 1896 I was hardly able to got up this morning but kept at the work slowly all day. I began to piece me a log cabin quilt. Will hauling corn. Friday September 25th 1896 I felt a little better today. I kept at the work and did some on the quilt. Will finished hauling the 1500 bushels of corn he had sold to Mr Ohl. Saturday September 26th 1896 I got my Saturday wash done early. Mrs Luse was out to get some apples. Will took a load of corn to town. It rained so I could not go in after dinner but Will went back for things we needed. Worked on the quilt. Sunday September 27th 1896 I was busy about the house most of the morning. It was a little muddy to go to church. We went down to Stevens to spend the afternoon. Did evening work after coming home and wrote in the evening. 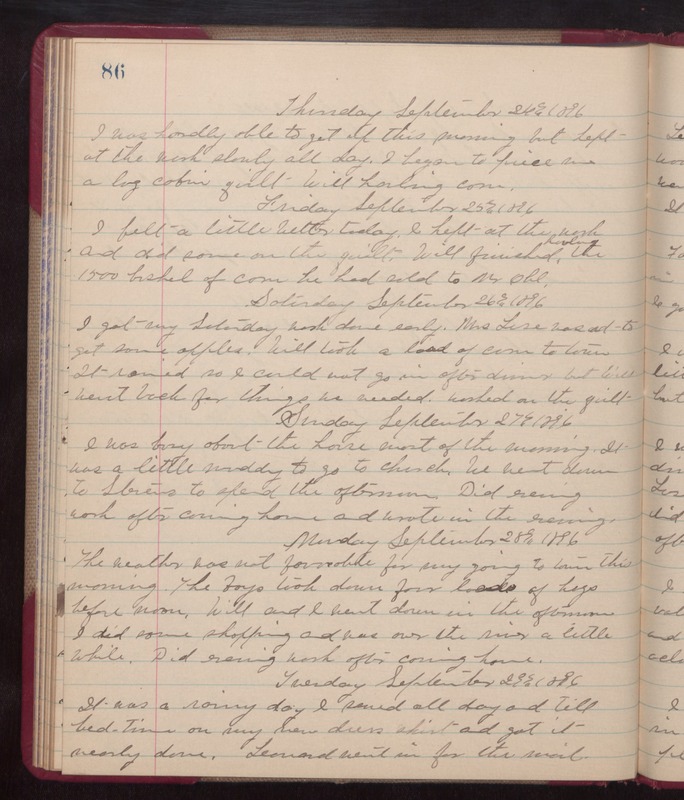 \Monday September 28th 1896 The weather was not favorable for my going to town this morning. The boys took down four loads of hogs before noon. Will and I went down in the afternoon. I did some shopping and was over the river a little while. Did evening work after coming home. Tuesday September 29th 1896 It was a rainy day. I sewed all day and till bed-time on my new dress skirt and got it nearly done. Leonard went in for the mail.